commercial cleaning services: Does green really clean? In today’s society, there is an alternative for everything – and cleaning is no exception. Type the word “green” into your internet browser, and it’s easy to see lists upon lists of earth-friendly products choose from. Type in cleaning solutions, and you may be startled by how many frightening chemical facts pop up. And to be honest, you should be a little afraid. When you think about it, the purpose of cleaning is to remove grime and germs, but at what expense it’s that to your own health? Especially when it comes to large-scale commercial cleaning. As going green is quickly becoming such a popular trend, you may be wondering if it really is that great? The truth is, at Geralex Janitorial Services, going green is much more than a trend; it is the life of our business. Green is effective, and we would love nothing more than to prove exactly that. 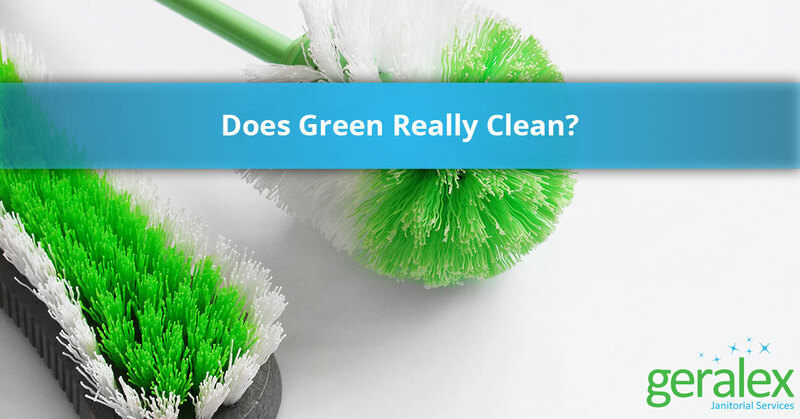 When you think “green”, you probably think natural; and when it comes to cleaning, is “natural” really as effective? Sure, you don’t want to be using a chemical to make your property clean, but how can “natural” really remove the dirt, grime, and germs like you need? Usually comprised of plant-based products, green products are designed with purpose and effectiveness in mind. Removing the harsh chemicals that can actually harm your furniture, floor, counters, and more- green products have proven to be just as effective (if not more than your traditional cleaning agents). Referring to both the product and the method used, green cleaning is a safe and effective way to ensure that your property is spotless without causing any harm to you or the environment in the process. Reducing the chance of corrosion in your pipes and removing the harmful toxins found in many mainstream commercial cleaning products, green cleaning products do, in fact, get the job done just as well because of their natural components. But when it’s all said and done, you may still be thinking to yourself, why should I choose green? Well, listen up. According to a study done by Rice, there are more than 80 thousand documented chemicals in cleaning agents; many of which whose environmental side effects have never been tested. If that’s not enough to make you believe that green is the better option, maybe it’s times to call in the pros and let us show you first-hand what green commercial cleaning looks like and why you’ll love the results. The one thing you should remember when deciding to go green or not is that not all eco-friendly and green products work the same. Luckily, that’s what we are here to help you with. Using high-quality products, you never have to worry about the clean we leave you with. Providing you with superior green cleaning, our goal is to take care of all your commercial cleaning needs in a professional and friendly manner. From our products to our practice, if what you’re looking for is green, look no further than Geralex. Contact us today to schedule your commercial cleaning.